EPISTLES FROM THE SCRIPTORIUM: 70 X 7 IS WHAT??? The Curt Jester has done it again with this new amazing product! 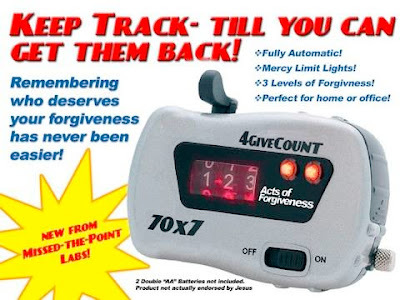 Have you lost track on how many times you've forgiven someone? Do you think you've exceeded that limit of 490 (that "seventy times seven times" that Jesus speaks of in St. Matthew's Gospel reading) in terms of times you've forgiven someone? Well, here's the product for you! See the Curt Jester for all the features! Good one, it's a little easier in the new lectionary. We only have to count to 77. Wow - that's 413 that we don't have to worry about - tee hee!